McCarter, 600 gallon, carbon steel, low pressure jacketed, chocolate melting and mixing tank with amount of chocolate per hour – depending on materials and application. Vessel inner chamber dimensions of: 62-1/2" ID x 68" in Length. Equipped with 32" x 24" top manway with lift off cover, full low pressure jacket rated to MAWP of 60psi @ 300 Deg f for heating and 60psi for water cooling with MDMT -20 Deg F @ 60psi and has (4) 2-1/2" ID and (2) 2" ID threaded jacket ports with sweep agitation and 5 Hp motor drive. 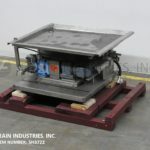 (1) 8" OD flanged center bottom discharge with 6" floor clearence and has e-stops front and back. Mounted on heavy duty (4) leg base frame. N/B # 105 and UL Rated. Moyno Model CC2L6 progressive cavity PD pump for uniform flow of viscous, or shear sensitive product. One stage pump has size L drive frame and size 6 (rotor & stator) with flanged Inlet and outlets. Blommer, carbon steel, water jacketed chocolate mixer. Number of pounds per hour – depending on materials and application. Vessel dimensions: 72" in Diameter; 126" long. Low pressure water jacket. 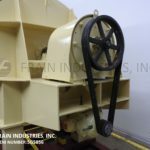 Equipped with a 24" x 24" manway with lift off cover, scrape agitation powered by a 15 HP drive, (1) 4" NPT center bottom discharge with 25" ground clearance and (1) 1½" NPT front discharge with 28" ground clearance. J.W. Greer, Model 2,500 lb, Carbon steel, full jacketed, chocolate melt and mix tank. Pounds of product per hour – depending on materials and application. Vessel dimensions; 50" in Diameter x 35" Straight Wall. Equipped with flat top and bridge mounted dual off set sweep agitation, full atmospheric jacket , side and top tempature probes and side tempature gauge. Side 3½" NPT discharge with 22" ground clearance. Mounted on (4) carbon steel legs. Stainless steel, skid mounted chocolate melter and pump. Pounds of product per hour – depending on materails and application. 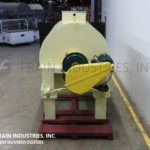 Equipped with a 40" long x 45" wide x 12" deep melting chamber with a bottom 38" long x 10" wide paddle agitated trough and Waukesha model 30 positive displacement discharge pump. Low pressure jacket and self contained heating system with electric heater and recirculation pump. Temperature range of -40 Deg F to 200 deg f standard and up to 300 deg F with hot clearence rotors / stators and viton seals. 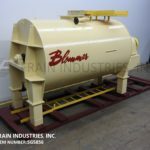 Blommer Model Dual Chamber, horizontal, carbon steel, 100,000 pound total, 50,000 pound each chamber, low pressure water jacketed, chocolate melting and mixing vessel, with pounds of product per hour – depending on material and application. Inner chamber dimensions: 60" in Length; 102-1/2" in Width; 128" in Depth each chamber. Equipped with covered flat top with 24 x 24 flip up covers each chamber with (1) 2" OD, (1) 4" OD threaded top ports has paddle style mixer set on 5" OD shaft, driven by 15 Hp (4) belt end motor drive with safety guarding. Low pressure, 1/2 water jacket each chamber with (4) 2-3/4" OD / 2-1/2" ID inner threaded jacket ports and (1) 2-1/2", (1) 2" threaded end bottom ports with temperature gauges and 6" OD center bottom discharges with 6" discharge height each chamber. Mounted on heavy duty, carbon steel, bolt down base frame. 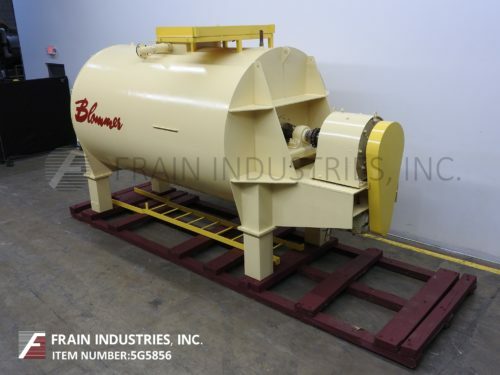 Blommer, 15,000 lbs, carbon steel, low pressure jacketed chocolate melting tank with number of pounds per hour – depending on materials, application and machine configuration. Vessel dimensions: 64" in Diameter; 95" in length and is low pressure jacketed. Equipped with 24" x 24" manway with lift off cover, lift out safety grate, and 2" ID product feed port. Sweep agitation and is powered by 15 Hp motor drive. 1" NPT front bottom discharge with 28" ground clearance and 7" x 7" flanged" center bottom discharge with 8" ground clearance. 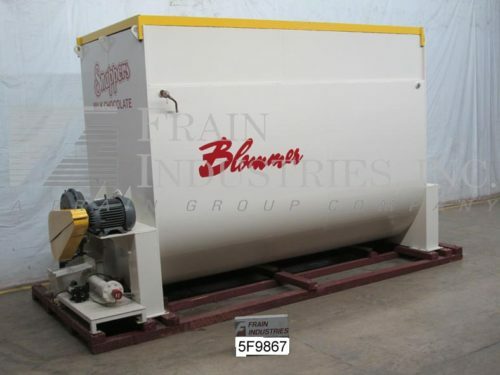 Blommer 60,000 lb, carbon steel, horizontal, low pressure water jacketed, chocolate melting and mixing vessel. Inner chamber dimensions: 170" in Length; 84" in Width; 118" in Depth. 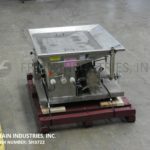 Equipped with enclosed top, 24" x 24" man way with hinged flip up cover, paddle style mixer with 7" OD shaft driven by 15 Hp motor drive and gear reducer with 25 – 1 ratio. 3/4 low pressure water jacket 5 psi with (4) inside welded baffles which divide jacket into (5) sections to direct the flow of water from front to back of each section and then through a circulation heater and back through the jacket sections, with (2) 2-1/2" ID threaded side jacket in / outlets each side and temperture probe. 6" OD threaded center bottom discharge with 7" discharge height without leg extentions and 26" discharge height with extentions and has (6) 1-1/2" OD threaded bottom jacket water drains. Control panel with on / off switch hand / off / auto control dial, e-stop and is mounted on (4) legs. Blommer 7,500 lb capacity, vertical, carbon steel, low pressure water jacketed, chocolate melting and mixing vessel. Inner chamber dimmensions: 72" ID x 48" straight wall. Equipped with flat top, dual flip top covers and bridge mounted sweep agitation, 5 Hp drive, with safety guarding and 4" OD shaft with side scrape paddles. Full low pressure water jacket rated to 5psi with interior baffles to direct the water flow through out the jacket, to a circulation heater and back to jacket (4) 2" OD side and (2) 1-1/2" OD bottom threaded jacket in / outlets and Watlow side mounted water heater circulation system. Dish bottom has 5-1/2" OD threaded center bottom discharge with 12" floor clearance, temp probe and mounted on (4) legs. Stainless steel, 40 gallon, chocolate melter. Pounds of product per hour – depending on materails and application. Equipped with a 52" long x 14" wide x 13" high melting chamber, internal heating coil, low pressure bottom jacket, 2½"OD / 2"ID Tri-clamp side discharge and self contained heating system with an 18 Kw heater and recirculation pump. Control panel with heater on/off switch. Brothers, 75,000 lbs, (2) chamber, carbon steel, horizontal, low pressure water jacketed, chocolate melting and mixing vessel. Pounds of product per hour – depending on materails and application. Inner chamber dimensions: 125" in Length; 84" in Width; 90" in Depth (each chamber). 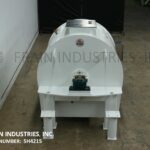 Equipped with enclosed top, (2) 18" x 18" man ways with hinged flip up covers, (2) 3" NPT charge ports, single ribbon style mixer driven by 10 Hp motor drive, low pressure water jacket, (2) 2" NPT bottom discharges.